If you place your order before 2PM central time (excluding weekends and holidays), we ship your package the same day! Same day shipping means that we will give your order to the shipping carrier the same day that you placed the order. It does not mean that your package will arrive the same day that you place your order. Order right now: We ship Monday, April 22. Thus, to accurately determine exactly when your order will arrive, you will need to use our fancy schmancy shipping calculator. It can be found on the Shopping Cart page as well as via any product page. *Please note that only UPS and DHL Express provide a guaranteed delivery date. USPS delivery dates are estimates only. 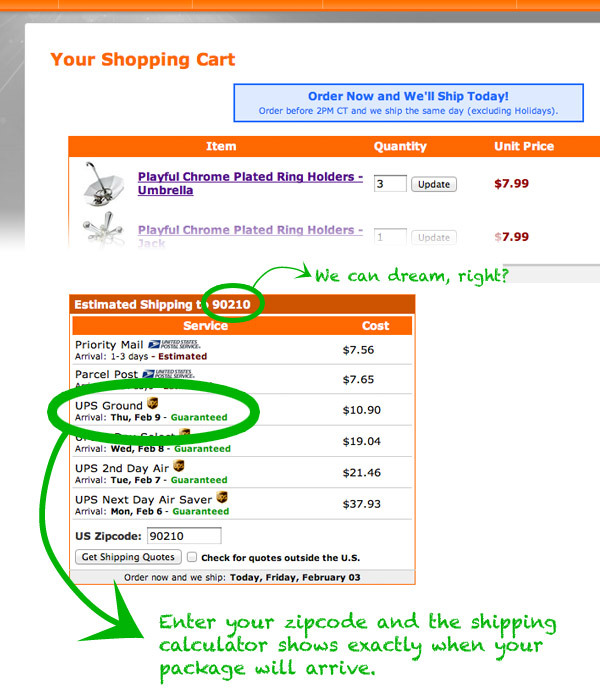 Use the shipping calculator on the shopping cart page to determine when your order will arrive.